I’m so glad for your visit. We’re currently in the process of shifting our skills and offerings, focusing much more on your online success strategy. If you’re interested in graphic design, let’s talk more. Because of our shift, we’ll do one of three things. Regardless of the option, you still need a strategy and execution plan. You should be skeptical. Marketing directors and C-Level Leaders blow millions on pretty sites every year, that don’t do jack. There’s lots to lose but more to gain with finding the right strategist. 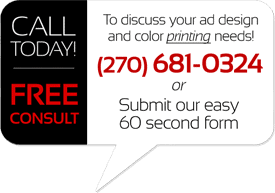 Call (740) 243-2952 and get the two questions that will put you on the right path. Or tell me to call you. If you feel like your 20 minutes have been wasted, coffee’s on us ($25 Starbucks Card comin’ atchya). Even in a web-driven world, businesses need print. Print advertising, business cards, letterhead, notepads, brochures, presentation folders, trade show banners, even canvas prints of your valuable staff… the list is endless. Most of our clients are looking for similar requirements: Design that\’s Professional (of course), clean, friendly, warm, inviting, elegant, … even “therapeutic.” At Hudge Creative, we take a concept and develop it into tangible, beautifully printed products without the need to pass things off to another company. Shipped right to your office from the best full color presses in the United States. No middle-man. Less confusion. Less hassle. We’re good at making things look great. And great-looking design says great things about your organization. More importantly, we create great-looking designs that are effective. When you’re competing in a world-wide market driven by multi-national brands, yours has to stand out. We find what’s unique about you and turn it into a custom identity tailored to your unique company. Whatever your print needs – from business cards and brochures to postcards and print advertising – we can create your project from scratch, print it and have it delivered to your door… or into the hands of your customers. You know what a picture is worth, right? A thousand words. Be sure your photographs are saying the right ones. Hudge is here for those corporate photos that instill confidence and convey your personality as well as the compelling and dramatic images that strike an emotional chord. © 2019 Hudge Creative Media Marketing.